There’s nothing better for a Texas summer night than sharing a great movie with friends and family. And if you can do it in style, why not? 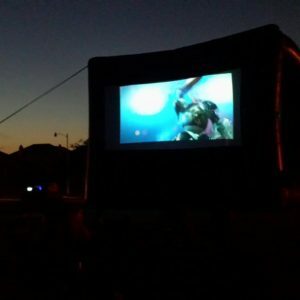 Our inflatable open air motion picture screen is great for kids’ parties, corporate events, reunions and even for family nights in your backyard. All you have to do is pick the movie! We’ll take care of supplying the screen, HD projection gear, powerful speakers, Blu-ray or DVD players. We can even rent you chairs for the viewing and plan your entire party around a movie theme. Since no movie is complete without popcorn, we can also provide you with a popcorn machine or a snow cone one. Or why not both? However you envision your movie night or your movie-themed party, we can make it happen. Jumper Bee has more than 20 years of experience in turning Texas parties from good to “wow!” and we’d be happy to do the same thing for you. You just need to call or email us, tell us a bit about your party and the crowd you’re expecting and we can provide you with free professional advice on how to make it a memorable one. The inflatable movie screen is just the beginning!